Open House weekend in London happens once a year, in September; when all sorts of buildings which you can’t usually see inside, both public and private, are open to the public – for free. 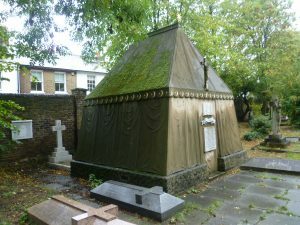 This year, my niece and I decided to visit the tomb of Sir Richard Francis Burton (1821-1890), Victorian explorer, soldier, linguist (he spoke at least forty languages), scholar and prolific author and translator who had long been a hero of mine. As you can see, it’s unusual to say the least. As a young man in India in the Bombay Light Infantry, Burton had studied a number of languages, and disguised himself as a local in order learn first-hand about Muslim customs and culture – to the alarm of his commanding officer, who felt that he had ‘gone native’ – though he found Burton’s accurate reports useful. Later, in 1851-3, under the auspices of the Royal Geographical Society, Burton made a pilgrimage to Mecca and Medina, disguised as the merchant Al-Haj Abdullah. On his return, he was honoured with the RGS’s gold medal. 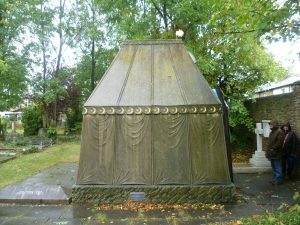 The Arab tent tomb, designed by his wife, Isabel, especially to reflect her husband’s deep interest in all things Arabic, from the tent itself, made of York stone, lightly carved to resemble the canvas of a tent, to the border of gold stars and crescent moons running round the outside. 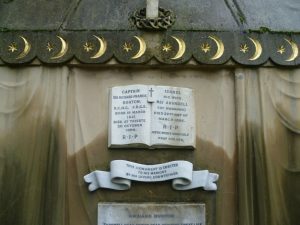 Detail of the border of gold starts and crescent moons. Shortly before his journey to Mecca, Burton met the convent-educated Isabel Arundell, from a distinguished Roman Catholic family. My ideal is about six feet in height; he has broad and muscular shoulders, a powerful, deep chest, he is an Hercules of manly strength. He had black hair, a brown complexion, a clever forehead, sagacious eyebrows, large, black wondrous eyes – those strange eyes you dare not take your off them – with long lashes. He is a soldier and a man; he is accustomed to command and to be obeyed… He is a gentleman in every sense of the word; and of course he is an Englishman. She got what she wanted – and it seems to have been love at first sight for both of them. But Isabel’s parents were horrified at the idea of this penniless adventurer who held some dangerously agnostic ideas, and wasn’t a Roman Catholic, marrying their precious daughter. They forbade any thought of marriage. Burton was not the sort of man to hang about. In 1855 he went on the ill-fated expedition with John Hanning Speke to central Africa to discover the source of the Nile, the hotly-debated geographical question of the day. And, while there, he was seriously wounded by a javelin which pierced both cheeks and left his face badly scarred. 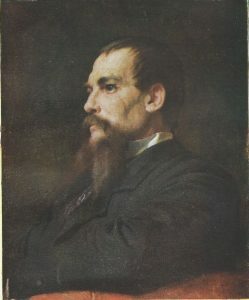 You can see the evidence in Leighton’s portrait. There is more to the Burton tomb than just the outside. Inside, it’s even more spectacular. There is a ladder up to a window set into the roof at the back where you can see what’s there. There are only three widely spaced, very uncomfortable rungs which are round rather than flat treads, and the ladder seems expressly designed to discourage users. It’s not easy to stand on the top one and lean over the window glass if you are trying to take a photograph at the same time. The floor inside is Carrara marble with Burton’s steel coffin on the right and Isabel’s mahogany coffin on the left. There is an altar with a cross etc immediately below you which you can see reflected in the mirror strategically placed in what, confusingly, looks like the far end of the tomb. 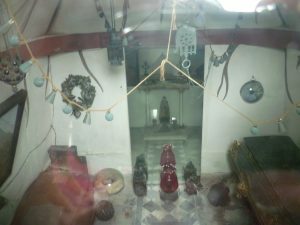 There are camel bells strung along rope draped over the arch, a wreath of faded flowers on the wall and a number of decorative glass lights on the floor. Originally, there was a hinged door to allow visitors to go inside – and the camel bells tinkled as the door opened but it has long since been walled up, alas. However, back to Isabel and Burton’s story. Eventually, when Burton was forty and Isabel nearly thirty, her parents relented – though they refused to come to the wedding. It was a happy – if unconventional – marriage. Isabel loved the travel and adventure, and enjoyed promoting her husband’s career. She was practical and down to earth and saw her role as wife as always putting him first. When he ordered her to ‘Pay, pack and follow’ as he did several times, she did so with alacrity. 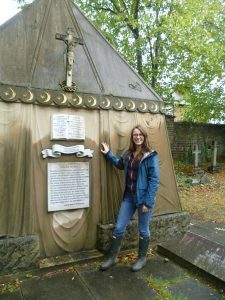 While we were there, we met Emily Lunn, officer for the Environmental Trust for Richmond and Thames, who will be shortly embarking on renovation work on the Grade II listed tomb. Emily very kindly said she’ll let me know when it happens; I’d love to see what’s going on – and I daresay my niece would enjoy it, too! Before we left, we went inside the Roman Catholic church of St Mary Magdalen to see the Burton stained-glass window put up by Isabel. She had always hoped that her husband would become a Catholic but he remained firmly agnostic. 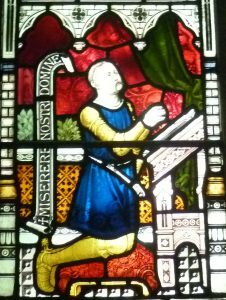 Looking at the stained glass depiction of her husband as a Knight Crusader, my first thought was that the artist had managed to emasculate him. He still has his long Victorian moustache, but he’s been given a haircut which resembles a monk’s tonsure – and his face has been smoothed out – the javelin scar has gone. In Isabel’s mind, he probably had a lot to repent – his scandalous (and best-selling) translation of The Arabian Nights in 1882, which included the sexually explicit bits usually omitted, for a start. After he died, prompted, apparently, by his apparition, she burnt all his private papers, and the manuscript of his unexpurgated and unpublished translation of The Scented Garden. I confess that I find this cultural vandalism difficult to forgive. Very fascinating! 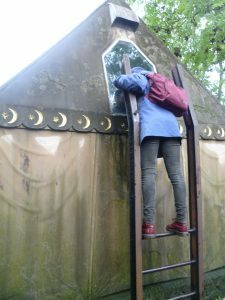 Thanks for writing about him/her and the fascinating mausoleum. I look forward to another post when they begin the renovations on it. Me, too, Vicki! I’d really like to see inside the tomb. I’ve seen proper photos of the inside from the 2010 restoration but that’s not the same as seeing it for oneself! Thank you for your comment, Steve. I’ll check out the Edward Rice biography. On a point of correct form, if you were knighted you would be Sir Stephen Tilson, and addressed as Sir Stephen – or Sir Steve if you preferred. but NEVER Sir Tilson. Come on, Steve! It’s only a small mistake, not a cardinal sin! Oh, I’m having you on. It was all in self-mocking fun, except the heartfelt last bit! Back on Subject: When reading the RFB bio, I was impressed to learn that Edward Rice spent a couple of decades assembling it. He eventually parlayed that research investment into other books on Burton and the Middle East. Thanks for another interesting post, Elizabeth. I always thought Burton was a fascinating figure. Like you say, someone who would make a lively companion at a dinner-party! Thank you, Gail. According to one of his contemporaries, Burton was a ‘brilliant conversationalist and a riveting lecturer.’ If he’d lived another 15 years or so, we could have heard him for ourselves. 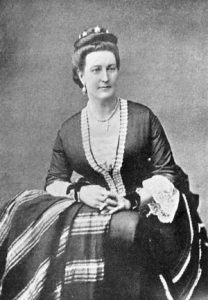 After all, there are recordings of Tennyson reciting ‘The Charge of the Light Brigade’ and of Florence Nightingale talking about her life. That is the most fabulous tomb I have ever seen. So appropriate. Well done, Isabel, say I. Always a fan of the Arabian Nights. My father gave my nephew an unexpurgated version but I’ve never read one. I think you can get it quite easily these days. I wonder what Sir Richard would think of the distance his bestseller has travelled, in both time and the vastness of media. Pantomimes, Disney, movies of all kinds, the list goes on. He’s given rise to so many versions of the fantastical Arabian world depicted in the stories, including a play I wrote and directed for school when I was head of drama – Arabian Fantasy – much to the disapproval of a scholar friend who knows and values the reality rather than the fantasy! Thank you for your comment, Elizabeth. I agree about the variety of the spin offs from the original Arabian Nights – including Rimsky-Korsakov’s ‘Scheherazade’ which Fokine turned into a ballet in 1910 for Nijinsky and Ida Rubenstein. Charles Dickens, too, loved the Arabian Nights from his childhood and he mentions various stories from it in his novels.